3-Bowl Ceramic Blue Cobalt 26 3/4" High LED Fountain | Fountain City Art Ctr. 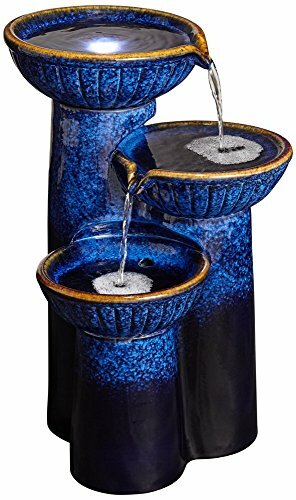 Three rich glazed finishes turn this ceramic outdoor fountain into a special attraction for any yard or garden. Black finishes the lower base, brilliant cobalt blue rises up and into the three bowls, and a beautiful ochre trim completes the palette. A single LED accent illuminates the top bowl, which sends a stream of water into the middle column's bowl, which spouts it into the bowl atop the short column. - 26 3/4" high x 17 1/2" wide x 18" deep. Weighs 19.5 lbs. - Decorative 3-column outdoor floor fountain with built-in LED light in top bowl. - From the John Timberland brand of fountains. - Ceramic construction; cobalt blue, black, and ochre glaze finishes. - Includes pump and cord. 26 3/4" high x 17 1/2" wide x 18" deep. Weighs 19.5 lbs. Decorative 3-column outdoor floor fountain with built-in LED light in top bowl. From the John Timberland brand of fountains. Ceramic construction; cobalt blue, black, and ochre glaze finishes.